The work is executed with financial support of the Russian Scientific Humanitarian Fund (RSHF (РГНФ), grant №08-04-12128b). As a part of “the World literature” class at Moscow University for the Humanities I give lectures and carry out seminars on the Renaissance epoch to students from the Department of Advertising. Therefore, my auditorium basically consists of people who prefer to study advertising technologies instead of to become a specialist in the field of literature studies. So, our Shakespearian talks are just a small part of the semester long course. Usually I have only a few hours of lectures and a few seminars from 6 up to 12 hours in total to tell about the whole Renaissance epoch. At lectures I am ought to give some background information on Shakespeare’s works, life and times, to say a few words on his contemporaries, the “life after death” of his heritage, a brief history of staging and to discuss some special aspects of the Russian perception of Shakespeare in the 18th–19th centuries. 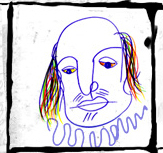 The seminars are generally devoted to the close reading practice of some well-recognized play of the Bard. Personally, I prefer to choose Hamlet to talk about with the students than, let’s say, Romeo and Juliet even if it is a part of the Russian secondary school program and hence is the most recognized play among the young people. Since Hamlet left such a significant trace in the Russian culture introducing this Shakespeare’s tragedy could be a harder, but way more interesting task for a tutor than to discuss with students disastrous, but lighter song of love and misfortune of Romeo and Juliet. phenomenon of the “Russian Hamlet” and the global criticism. Sometimes it is hard to encourage students to read the tragedy in completeness mostly because of its length. Even if Russian students are in more advantageous situation (because of what they have to read is a contemporary translation) then, lets say, Anglo-Americans who have to read the archaic original written in the Old English. I do not aim to improve the English language skills of my students, but by reading in class parts of the tragedy in Russian translation and compare them line by line with the original English text gives a slight possibility to develop cross-cultural literacy. In order to make students read the full text, the lecturer have to provoke and stimulate their interest in the Elizabethan age and to popularize Shakespeare as a personal model of the world’s most avowed author. It is very necessary to describe the essence of Shakespeare’s cultural successes through space and times (Romantic cult, Shakespearization and Shakespearism) and especially in the Russian culture. A brief outlook on the phenomenon of “Russian Shakespeare” and “Russian Hamlet” could be helpful. The name of Shakespeare and the play entitled Hamlet appeared in Russia for the first time in 1748, both in the works by a Russian poet Aleksandr Sumarokov. In his Epistle on Poetry Sumarokov placed Shakespeare among the other immortal poets of the Universe: “Milton and Shakespeare, the latter, although unschooled”. The prejudgments considering Shakespeare’s ignorance and barbarism (thanks to the French classicism and writers such as Voltaire) were adopted by Sumarokov as a poet and dramatist who wrote with accordance of its rigid patterns and strict classical rules of poetry. It is notable that Sumarokov himself put a comment on the British dramatist in the notes to his Epistle on Poetry: “Shakespeare, English tragic and comic writer, in whom there are many things of very fail (awful) and very much of exceptionally fine. DiedApril 23, in 1616, on the 53rdyear of his life” («Шекеспир, аглинский трагик и комик, в котором и очень худого, и чрезвычайно хорошего очень много. Умер 23 дня апреля, в 1616 году, на 53 века своего»). Meanwhile, such was the first reaction on Shakespeare in the Russian literature of the 18th century. And it is especially noteworthy in terms of the Russian revision of the Shakespeare's dramatic and poetic work in Sumarokov's adaptation of Hamlet (1748). The main Sumarokov’s source for his drama was perhaps Pierre-Antoine de La Place’s French translation (Theatre Anglois, 1745–1748) of Shakespeare, but there is a proof (the list of the books that he loaned from the Academic Library back in 1746–1748 where an original text could be found). Unfortunately, we don’t have any strong evidence regarding the level of English knowledge by Sumarokov. Even if he knew any English his adaptation of Hamlet is rather an original composition then a translation of any kind. Besides of usage a few motives and character’s functions Sumarokov basically wrote a play of his own. Possibly that was the reason why he did not mention Shakespeare as his source on the cover of his drama when it was printed. And even more, he declared Shakespeare’s following only in two episodes: the famous Hamlet’s monologue in the end of the third act and Claudius prayer. It other parts of the play he changed a very core of the Hamlet’s plot: first of all the Ghost of Hamlet’s father was transformed to expression of fantastic nature as a trivial dream; secondly, all major characters have servants (confidants and confidantes), thirdly, it is Claudius who alone with Polonius plans to kill Gertrude and then force Ophelia to marry to “illegitimate King of Denmark” (there is a lack of declaration of his blood relationship with the late monarch). But most important of all is that Sumarokov’s Hamlet from the very beginning to the very end of the play is presented as a man of strong will and resolute actions. He escapes from lots of attempted murders and defeats his enemies with a triumphant victory. The end of the play is also noteworthy: Gertrude repents и takes the veil, Polonius commits suicide and the Prince receives crown with cheerful growl of the crowd and marry his beloved Ophelia. Even if this altered Shakespeare's creative work and it bears very little resemblance to the English originals this example of early Russian reception of the great play is a very relevant link to the further formation of Shakespeare’s reputation. The revelation of the real Shakespeare in Russia (just like in many other European countries) was due to the Romantic movement that formed Shakespearean cult among its followers. The Romantics took Shakespeare as their predecessor, an artistic model that would help to find solutions to the problems of their national literatures. It was a key approach towards assimilation of Shakespeare: he was Russified in compliance with the aims of the national literature. Such was first adaptations and translations of the first part of the 19th century, such was the usage of Shakespeare images in the Russian poetry and original creative works. It could be shown by reading relevant verses of Russian poets like A. Blok, M. Tsvetaeva, B. Pasternak and V. Vysotsky that could help to bring Hamlet closer to understanding for modern youth. Based on the experience of integration the new information technologies into teaching process in the field of the humanities I like to use some multi-media to “spice up” some parts of our discussions a bit. The most successful way to do so among Russian students is to show some parts of different video adaptations at class or ask them to surf the Internet (perhaps to visit the Globe web-site) or make some virtual travel to the land of Shakespeare (Stratford-upon-Avon) and get acquainted with the epoch, geographical landscapes and culture. Besides the usage of movies and the Internet I ask to stage some parts of the play by the students themselves. Sometimes just a short stage or dialogue between classmates can be more inspiring to oneself to get deeper into the genius of Shakespeare then countless hearings about importance of his role in the evolution of your own native culture.